Today we will focus on giving feedback about your Final Project and reviewing topics for the Final Exam. 1. 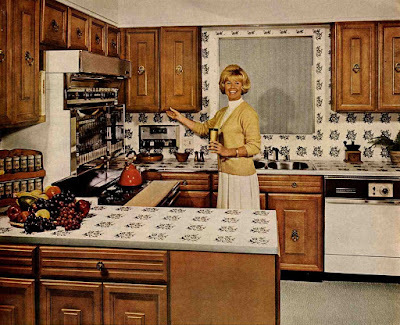 Fragment from "How a Decade of Domesticity Changed our Nation's Kitchens" by Nancy Mitchell. 2) Home builders looking to appeal to the middle class began developing smaller, less whitewashed kitchens that felt more 'homey'. 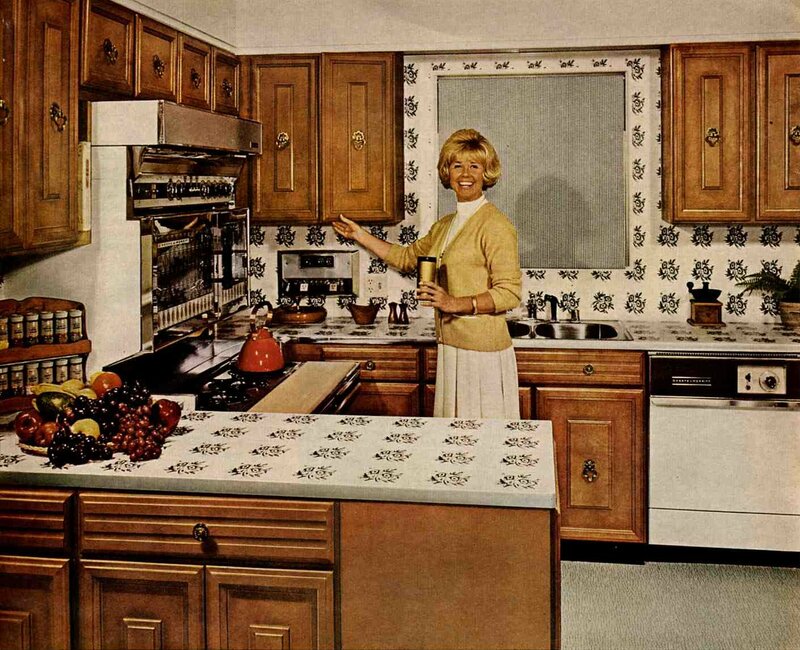 This design would eventually become a mainstay in homes across America as the kitchen became smaller and felt more like a comfortable 'command center' than its own room. 2. Fragment from "The Evolution and Dissolution of the Soviet Kitchen" by Nadien Astrakhan. During the 1950s, Nikita Khrushchev’s goal was to return to the concept of single-family apartments. Even if they were cheaply built with no frills, they gave Soviets privacy and peace of mind. There were many in the government who disagreed with this idea, claiming that when families lived alone, socialism was replaced with bourgeois consumerism. Magazines of the time wrote to women and teenage girls, reminding them that even in a time of demand for consumer goods, they should still be cautious and live a modest lifestyle. 3. Fragment from the speech where President Harry Truman began outlining the Truman Doctrine. I believe that our help should be primarily through economic and financial aid, which is essential to economic stability and orderly political processes. The world is not static, and the status quo is not sacred. But we cannot allow changes in the status quo in violation of the Charter of the United Nations by such methods as coercion, or by such subterfuges as political infiltration. 4. Fragment from the speech where Premier Leonid Brezhnev began outlining the Brezhnev Doctrine. Each Communist party cannot but take into account such a decisive fact of our time as the struggle between two opposing social systems: capitalism and socialism. This is an objective struggle, a fact not depending on the will of the people, and stipulated by the world's being split into two opposite social systems. Lenin said: "Each man must choose between joining our side or the other side. Any attempt to avoid taking sides in this issue must end in fiasco." 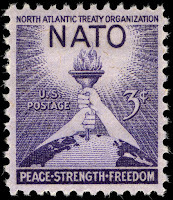 It has got to be emphasized that when a socialist country seems to adopt a "non­affiliated" stand, it retains its national independence, in effect, precisely because of the might of the socialist community, and above all the Soviet Union as a central force, which also includes the might of its armed forces. The weakening of any of the links in the world system of socialism directly affects all the socialist countries, which cannot look indifferently upon this. 5. Promotional picture of American actress Doris Day at a typical kitchen in Malibu, California, in 1966. 6. Still from the 1979 Soviet film "Moscow Does Not Believe in Tears". 7. 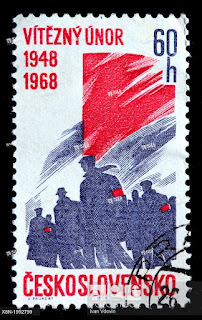 Czechoslovak stamp commemorating the 20th anniversary of the 1948 coup d'etat that established the Czechoslovak People's Republic. 8. 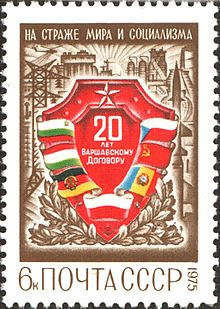 Soviet stamp commemorating the 20th anniversary of the Warsaw Pact. 9. 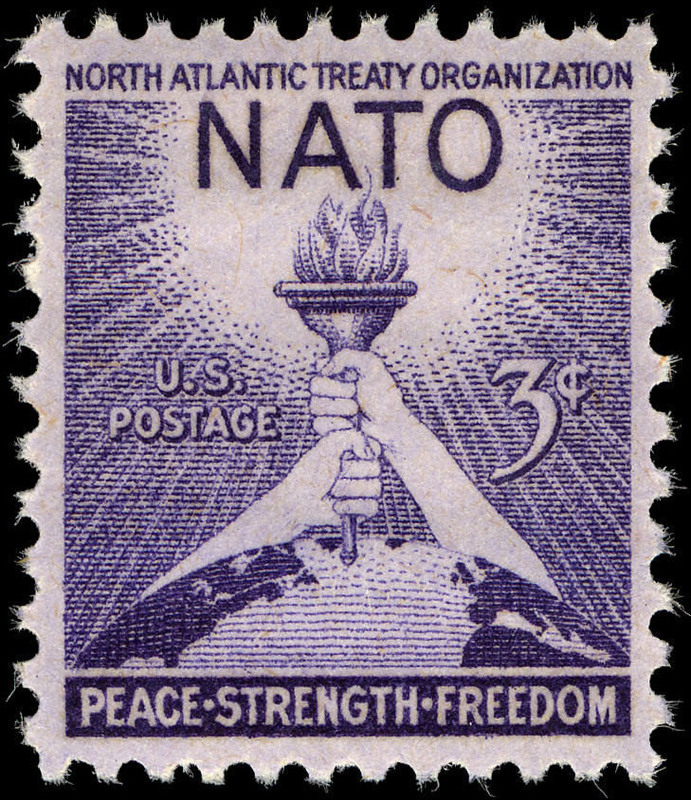 American stamp commemorating the creation of the North Atlantic Treaty Organization.